Receive the support, encouragement and guidance to develop essential skills and expertise, so you can stretch yourself and create high-quality work. During their final year, Marcus Crandon and Ryan James won a competition to design the trophies for the 2011 Abercrombie Awards. The duo used their insight and creative talents to achieve an outstanding piece of artistic design. Phil Power, senior lecturer in Fine Art, gave the students a briefing about Sir Patrick Abercrombie, the architect of modern Plymouth, and the pair then did their own research before designing the trophy. Using modern and traditional materials, Marcus and Ryan based their work on the face of Sir Patrick. They focused on highlighting distinctive features of his face such as his monocle, prominent nose and hairline. 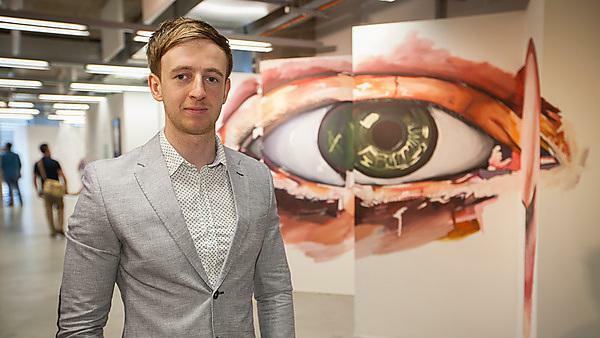 Since graduating, Marcus has progressed onto the MA Contemporary Art Practice course at University of Plymouth, and his work continues to draw media attention. In this MA Contemporary Art Practice performance, Marcus aimed to explore the 'iconic image of the beard' - looking at the contrast between the inherent masculinity of the beard, and femininity of tweezers..
BA (Hons) Fine Art graduate Samuel Stenning was handpicked during his studies for the collaborative Hans Brinker exhibition and competition in Amsterdam – an annual expo for talented student painters from around the world. In 2010 recent graduates James Eden and Olly Rooks entered the prestigious Jerwood Drawing Prize. Just under 3,000 entries were submitted to the competition for consideration by the distinguished panel of selectors: Charles Darwent, Art Critic, Independent on Sunday; Jenni Lomax, Director of the Camden Arts Centre; and Emma Talbot, artist. James and Olly won the £1,000 Student Prize for their film Burst, which chronicles a series of graphite balloon bursts, each one creating a unique artwork on a white wall. You can view the award winning film on Olly's Vimeo channel.